SUBANG JAYA: IJM Land Bhd, the property arm of IJM Corp Bhd, is confident of a good 2011 despite a challenging year brought about by the global economic slowdown and European debt crisis. 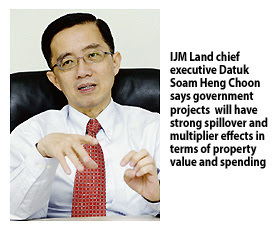 IJM Land chief executive officer and managing director Datuk Soam Heng Choon said despite a slowdown in some areas such as the Kuala Lumpur City Centre and Mont Kiara, the property market is still resilient in other areas like Penang and Sandakan. "Property projects, which cost RM500,000 a unit, are still selling strong and the government's mass rapit transit project and the various economic transformation programmes will have strong spillover and multiplier effects in terms of property value and spending," Soam said after the company's annual general meeting. Soam said the company, which is 67.07 per cent owned by IJM Corp Bhd, will launch projects with a gross development value (GDV) of RM2 billion and RM1 billion within the current financial years ending March 2012 and March 2013 respectively. IJM Land has a landbank of 1,943.3ha nationwide with a GDV of more than RM19 billion, enough to keep it busy for the next 12 years. Soam said the company is still open to mergers and acquisitions despite the failed tie-up with Malaysian Resources Corp Bhd. It will not expand its overseas projects in China and Vietnam for the time being. The company expects to register slower growth this year as the property market had stretched last year, which saw 375,000 units of various property units launched with a combined GDV of RM109 billion.